This paper discusses a project with a small group of children learning English as an a language (EAL) at a pre-school in Scotland. The project however could be replicated across the globe, in any classroom with a diverse range of learners, with particular benefit to minority and newly arrived migrant children. At the project’s core was the aim to bring the children’s first language and culture into the classroom, drawing in particular on Cummin’s (1984) Common Underlying Proficiency model, which asserts that knowledge of one language can assist learners in their acquisition of another. 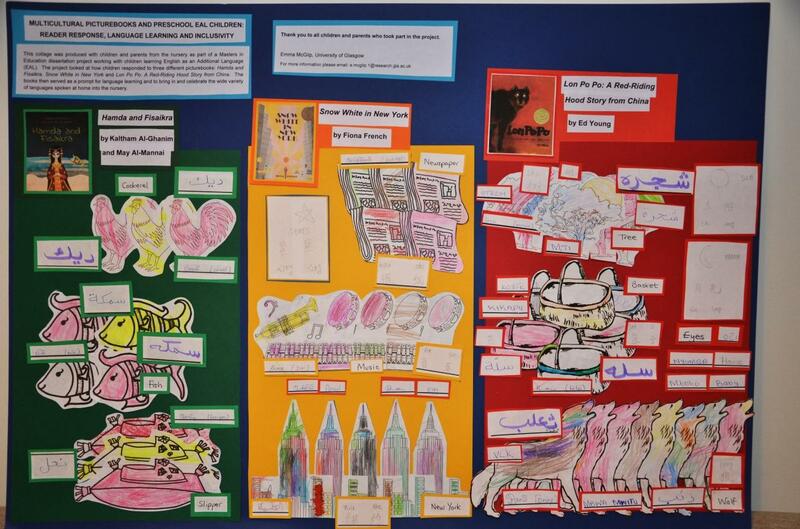 The project used multicultural picturebooks to validate the learner’s experiences and culture, and then called on parents’ funds of knowledge to make the children’s first language visible in the classroom. This joint working between the children, parents and the pre-school culminated in the production of a multilingual collage – a prominent display that recognises the value of the children’s first language in the classroom, builds bridges between home and school and is reflective, and proud, of an increasingly multilingual Scotland. There are an increasing number of children learning English as an additional language (EAL) in Scotland: in 2013 there were 29,532 EAL learners, an increase of more than 3,000 since 2012 (Scottish Government, online). While the national average is 4.4 per cent, in urban local authorities such as Glasgow this percentage is believed to be closer to 15 per cent (Arizpe & McAdam, 2011). In recent years the Scottish education authority, Education Scotland, has published several reports advising teachers how best to support this increasing number of EAL learners. Learning in 2 (+) Languages (2005) is a comprehensive guide to best practice with bilingual children, highlighting the positives of bilingualism and educating teachers as to how to support EAL learners in the classroom. A more recent policy document however, Count us In: A Sense of Belonging – Meeting the needs of children and young people newly-arrived in Scotland, addresses the challenges facing many schools and highlights that ‘many class teachers do not feel confident in knowing how best to respond to newly-arrived children’s diverse learning needs’ (HMIE, 2009, p. v). This paper, discussing a project with a small group of EAL learners, adds to the growing body of research exploring how educators can support bilingual and in particular migrant learners. Although this project is set in Scotland, its findings are relevant to educators working with bilingual learners globally. In this paper, I explain the rationale behind maintaining the learner’s first language (L1) and involving parents in their children’s literacy learning. I then move on to discuss the project itself, including the children who participated and the journey we went on – from reading the picturebooks to producing and discussing the multilingual collage that went on display in the pre-school. Children learning EAL tend to be sequential bilinguals – they already have knowledge of one language and are learning another. This is in contrast to simultaneous bilinguals, who acquire two languages at the same time (Lightbown & Spada, 2006). For sequential bilinguals, maintenance and development of their L1 will aid the acquisition of their second language (L2), which is known as additive bilingualism, and enables learners to [End of Page 32] continue in their cognitive and emotional development in a language they are comfortable with (Lightbown & Spada, 2006). This additive approach is highlighted in Cummins’ (1984) Common Underlying Proficiency (CUP) Model, which uses the analogy of two icebergs showing knowledge of two different languages, while below the surface of the icebergs there is considerable overlap and consolidation and one central processing system (Baker & Jones, 1998, p. 81). Cummins explains that ‘this common underlying proficiency is theoretically capable of being developed through instruction in either language’ (1984, p. 4). Cummins further presents the Interdependence Hypothesis Model, whereby knowledge gained in one language can be transferred into another (2001), therefore when learners acquire a new skill or concept, they do not learn it in just the one language, instead ‘ideas, concepts, attitudes, knowledge and skills transfer into each language’ (Baker & Jones, 1998, p. 81). This knowledge transfer includes literacy and communication, as children’s knowledge of literacy practices in their L1 can be used when communicating in another language (Barratt-Pugh, 2000, p. 75). However, EAL learners are particularly at risk of subtractive bilingualism, where, because of social pressure to learn the national language, English, less value is placed on the support of their L1 (Lambert, 1981). While this devaluing of their language and culture can lead learners to feel socially inferior, Cummins (2001) asserts that teachers who approach their role with the view of adding to learners’ existing language repertoire can in fact empower their students. With some 143 different languages recorded in Scotland in 2013 (NALDIC, 2013), it is not possible or necessary for teachers to teach the children’s L1 – educators can still adopt the additive approach by showing children and parents that their L1 is valued in the school context. Taking an interest in and valuing children and parent’s funds of knowledge enables educators to draw on the strengths of individuals and bring them into the classroom (Moll, Amanti, Neff & Gonzales, 1992). The concept of funds of knowledge, that is the knowledge and resources gained outside the classroom through life experiences (Gonzáles, Moll & Amanti, 2005), has been further developed to include the term ‘funds of identity’ – which is when people actively use these resources, or ‘box of tools or signs’, to describe themselves (Esteban-Guitart & Moll, 2014, p. 33). Recognition of families’ funds of knowledge and identity strengthens the links between home and school, with a positive effect on children’s attainment, as ‘when educators involve minority parents as partners in their children’s education, parents appear to develop a sense of efficacy that communicates itself to children, with positive academic consequences’ (Cummins, 2001, p. 664). In her study, using the skills of parents to co-create bilingual dictionaries, Danbolt stresses this is particularly important with EAL learners, explaining that linguistic minority parents may feel excluded, and schools should actively attempt to link with these parents to facilitate the learners’ literacy development (2011, p. 8). Danbolt uses the metaphor of building bridges between home and school, and suggests that educators should disrupt the one-way nature of the communication, and instead seek to involve the parents, drawing on and valuing their language skills and role in their child’s literacy development, and making the traffic flow both ways (2011, p. 14). Education Scotland’s Learning in 2+ Languages stresses creating an environment where bilingual parents feel welcome, asking, ‘When a parent enters your establishment, do the pictures on the classroom walls, the displays in the reception area and corridors and prospectuses and other literature convey that your school represents a multilingual and multiracial Scotland?’ (2005, p. 9). In Scotland, all 3- and 4-year-olds are entitled to free pre-school education. This provision comes in several different forms: local-authority-run pre-schools, private day-care nurseries and voluntary groups. In addition to providing learning opportunities in line with Scotland’s Curriculum for Excellence, the pre-school providers are expected to ease the transition into primary school. For this project, I worked with a local authority pre-school with a large number of EAL learners. 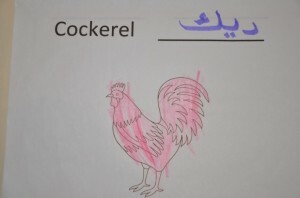 A specialist EAL teacher visited the pre-school regularly, and helped to facilitate this project. The children listed in Table 1, of varying English language competences, were put forward for the project by their EAL teacher (pseudonyms have been used). The children were selected on the basis that they would attend school on the days I was in the pre-school; were currently receiving EAL support and had parental consent. Parents were approached in the first instance by pre-school staff, following which Plain Language Statements were sent home with the children together with Consent Forms, which were duly returned. I have indicated the children’s home languages and English proficiency based on information from their teacher and my own observations. When selecting the picturebooks for this project, in the hope that it would instigate a discussion as to the validity of the different interpretations, I chose multicultural versions of well-known fairy tales. Multicultural children’s literature can be broadly described as ‘literature that is by and about diverse populations and includes diverse perspectives’ (Gopalakrishnan, 2011, p. 29) and provides ‘uniquely refined story contexts that identify the complexity of understanding self and others in light of the communities in which we live’ (Mathis, 2011, p. 105). Although the benefits are well documented (for example, Botelho & Rudman, 2009; Short, 2009; Mathis, 2011), educators can be reluctant to use multicultural texts in the classroom, from worries about choosing an accurate text to directing the related conversation appropriately (Short, 2009). There are an increasing number of guidelines and criteria available to educators to aid their selection (Yokota, 1993; Gopalakrishnan, 2011; Mendoza & Reese, 2001). I chose fairy tales for the project because it presented the opportunity to challenge dominant cultural norms and highlight the different cultural interpretations, and I had Rabina in mind when selecting texts, choosing picturebooks that did not conform to the stereotyped, Disneyfied images now commonly associated with fairy-tale characters. Given the variety of languages spoken, I chose English as the medium and specifically selected picturebooks with a strong sense of culture in the visuals. Consideration was also given to issues such as authenticity and accuracy, perspective and language. 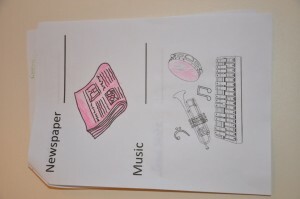 The picturebooks selected for inclusion in the project are described on the next page. 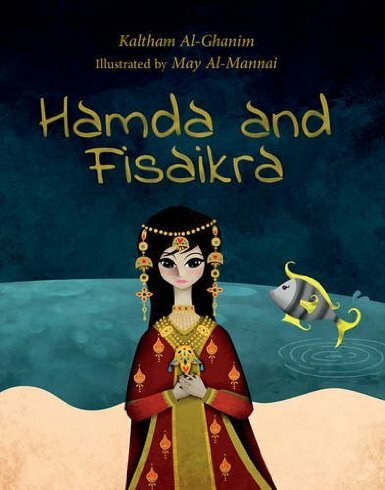 Described as the traditional tale of ‘the magical Fisaikra fish that comes to the rescue of poor Hamda, the Cinderella of the region, and unites her with her prince’ (Bloomsbury Qatar, 2011), the book was produced in Qatar by ‘a completely local team’, is available in both Arabic and English, and was nominated for the Etisalat Prize awarded by UAIBBY, ‘the most prestigious and valuable children’s book award in the Arab world’ (Bloomsbury Qatar, 2011). Literally translated as ‘Grandmother Wolf’, this retelling by Ed Young is ‘translated from [a] collection of Chinese folktales’ (1989, [endpapers]) and is the winner of the 1990 Caldecott Medal. This story is not dissimilar to the western Little Red Riding Hood tale, but here the children’s mother leaves the children alone to visit their Grandmother, or ‘Po Po’. The images are in a series of frames or panels, and the use of colour and shadow in the images is subtle, yet powerful. The story is told from an insider perspective, and while there is no Chinese script evident in the book, the use of ‘Po Po’ instead of grandmother lends it a more authentic feel. 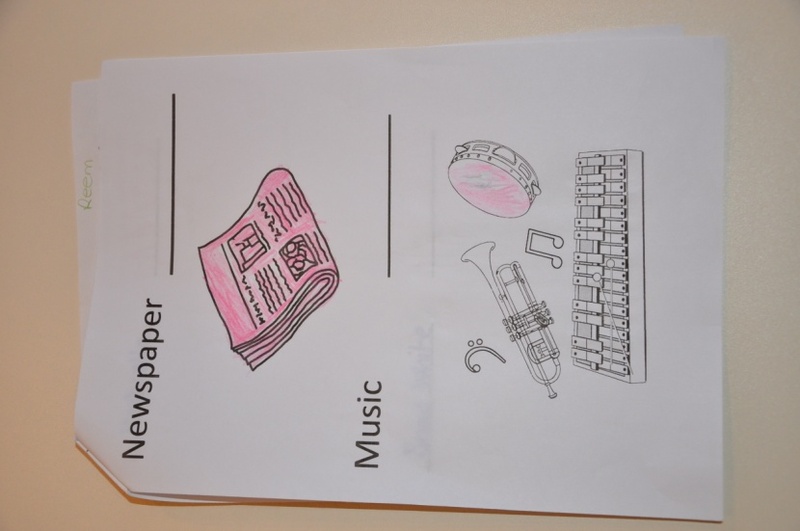 I digitally recorded the readings of the picturebooks and the children’s responses, and then also the discussions as the children were colouring in the pictures and adding new words and pictures to their lists. I also recorded the conversations as the children were viewing the collage. All recordings were then transcribed using pseudonyms. Although video recording would have been useful to record facial expressions and actions, this was decided against due to its potentially intrusive nature. The children’s responses as we read through the picturebooks were particularly thought-provoking, as while there were numerous examples of the children responding to the unfolding events in the images and narrative, there were few comments, or questions, as to the culture specific elements, for example the traditional costumes in Hamda and Fisaikra. One tentative suggestion for this is that these children have a high degree of intercultural awareness – they live in diverse communities, with the pre-school itself comprising children of many different languages and cultures, and therefore are more accepting of a wide range of cultures and perspectives, having what Byram, Nichols and Stevens (2001) call ‘the ability “to decentre” ‘ (2001, p. 5). Alternatively, they could have been curious as to some of the unfamiliar cultural elements of the picturebooks, but either felt it is not appropriate or that they did not have the right to voice their opinions, drawing on what Bloome and Egan-Robertson call entitlement rights – that is ‘who gets to make what intertextual relationships and how’ (1993, p. 312). Yet, because the children did not explicitly respond, it does not mean that the cultures and traditions in the picturebooks were not recognised and validated, either consciously or subconsciously. For example, there is an image in Hamda and Fisaikra where the fish were painting henna on Hamda’s hands in preparation for the ball, an event that received no comments from the children. In the final session, when the children observed the developing collage, I noticed and pointed out that Sumayah and Aneela had their hands painted with henna. The girls briefly explained who had done it, and their EAL teacher and I complimented the intricate artwork. Although Sumayah and Aneela did not explicitly respond to the henna painting when we read the picturebook, it was still an opportunity for them to recognise themselves in the text, and highlights the importance of including multicultural children’s literature in the curriculum to validate the children’s experiences and culture. 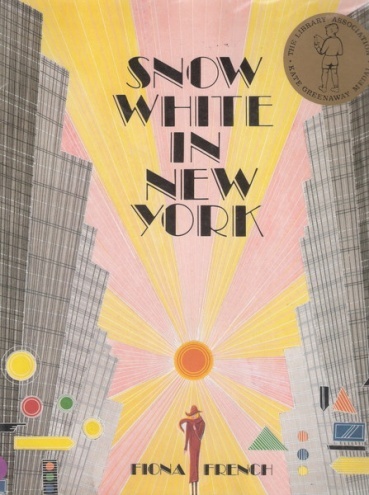 Learners may similarly produce what Sipe terms ‘life to text’ responses (2008, p. 152) to picturebooks portraying a culture akin to where they are now resident, as can be seen from Thomas’s observation during the read-through of Snow White in New York. 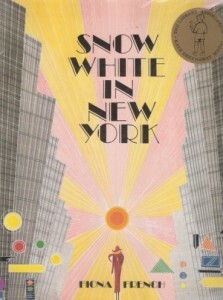 While the majority of responses to this picturebook were referential, with the children [End of Page 40] taking the opportunity to practise their increasing vocabulary and in particular to identify the different colours and shapes in the images, Thomas pointed to the skyscrapers in the Manhattan skyline and responded with the name of a street in Glasgow that features several high rise tower blocks. This response is interesting for two reasons. First, the linking of the two landscapes in this personal response highlights Thomas’s increasing intercultural awareness and how his new cultural experiences are shaping his meaning making. Second, as Thomas was new to English and rarely responded verbally in the sessions, this observation serves as a reminder that it is not appropriate to distinguish between levels of thinking with EAL learners, that is to say that one response is evidence of greater understanding than another, as in line with Cummin’s (1984) CUP model, language proficiency is simply a surface feature of the underlying knowledge. While the children’s responses to culture were subtle, Amy and Thomas were visibly delighted with the inclusion of a picturebook that featured words from their first language. The two Mandarin children were noticeably quieter members of the group, and while they would whisper to each other in Mandarin, during group discussions they were mostly silent. Recent research with children in a Gaelic language pre-school highlights that learners ‘may struggle to express themselves in the target language, and may well remain silent for relatively protracted stages as they become familiar with the new language’ (McLeod, 2011, p. 10). While this silent period is to be expected (Krashen, 1981), their lack of engagement in activities meant that Amy and Thomas were easily distracted by other events in the nursery and were at times reluctant to participate. Yet when reading Lon Po Po: A Red Riding Hood Story from China, both listened intently from the outset of this reading, having heard the words ‘Po Po’ and ‘China’ in the title. Their increasing giggles every time ‘Po Po’ (grandmother) was mentioned had a positive impact on all of the children, with the result that toward the end of the story all of the children were laughing and saying ‘Po Po’. The inclusion of Lon Po Po in the project had a significant impact on the two Mandarin children. Amy was notably more confident, happy and engaged during this and the subsequent session. Thomas, who remained mostly silent, was also engaged throughout and although limited by his knowledge of English, used whatever communicative tools available to him – for example performing the action of a wolf leaping. I would conclude [End of Page 41] that the change in Amy and Thomas’ willingness to participate – they were both engaged, smiling and generally more confident, traits that will inevitably have a positive impact in their learning – adds to the growing body of research as to the benefits of using literature that recognises and values each learner’s culture and L1, and is especially important for newly arrived children. While it would be speculative given the small sample size to arrive at any conclusions, there are tentative findings that would be worth exploring in further research. For example, Hamda and Fisaikra (an originally Arabic text set in the Arabian Gulf) had just three word lists returned, and two of those were in Arabic. Given that these parents responded to Hamda and Fisaikra and not Snow White in New York could suggest that the parents were more interested in the Arabic tale, or perhaps because it was related to their [End of Page 42] culture felt more obliged to complete the list. The considerable increase in response to the final book, Lon Po Po: A Red-Riding Hood Story from China could be due to many factors, one being that the children would have more fully grasped the purpose of the word list and relayed this to their parents, or perhaps the parents were more familiar with this fairy tale. Regardless, the level of response to the project is evidence of parents’ willingness to participate in their child’s education. Several parents added their own words and translations to the lists provided, for example Mandarin ‘stars’, Slovak ‘eyes’ and Tamil ‘pencil’ (see Figure 2). The use of the languages’ authentic scripts instead of the Roman alphabet, such as use of Arabic script (see Figure 3), suggests that this authenticity was important to parents. To return to Danbolt’s (2011) analogy of the flow of traffic between home and the school, parents’ participation in the project meant the traffic was flowing both ways, as parents’ input was vital in producing the multilingual collage. 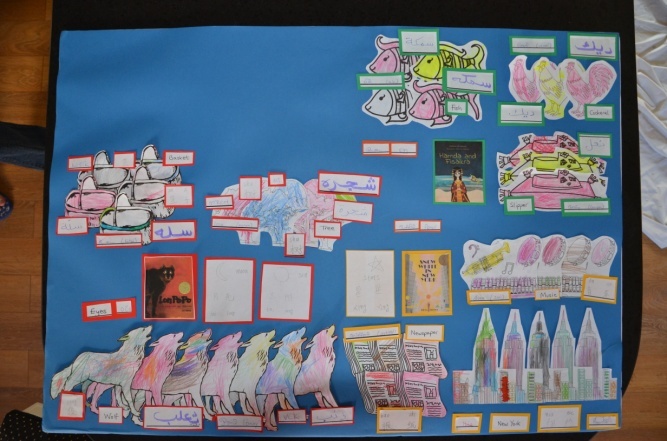 In the final session, the draft collage was presented to the children (see Figure 4) and together with their EAL teacher we reflected on the project. Immediately upon seeing the collage, Amy laughed enthusiastically and pointed out the Mandarin to Thomas. Amy was visibly pleased at the Mandarin writing, and when prompted she informed the group of the Mandarin word for moon, an exciting development given her previous silence and resistance. Following a re-reading of Lon Po Po: A Red-Riding Hood Story from China, which the children voted for as their favourite picturebook, we asked the children what they called their grandmother. Several of the children answered in their L1 and received positive feedback and admiration from the group. 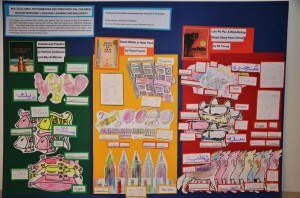 The collage had already served its purpose – as a prompt to bring the children’s L1 into the classroom. Finally, the conversation was steered toward the multilingual nature of the collage, and the children were asked if they had seen another picture with lots of different languages. With support, the children made the link between their collage and the multilingual posters at the front door of the pre-school, with the children coming to the conclusion that they were there so that all of the parents could understand them. In this [End of Page 44] discussion, we did not expect the children to make elaborate comments as to the inclusion of their L1 in the collage, rather we hoped they would unwittingly take on board its aims, as its very presence in the pre-school setting acknowledges the value of each child’s language and culture. Figure 5. The completed collage. Al-Ghanim, K. (2011). Hamda and Fisaikra. Al-Mannai, M. (illus.). Dohar: Bloomsbury Qatar Foundation Publishing. French, F. (1989). Snow White in New York. Oxford: Oxford University Press. Young, E. (1989). 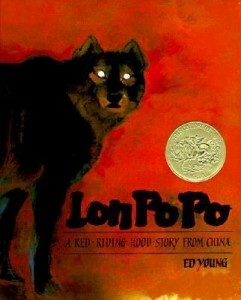 Lon Po Po: A Red-Riding Hood Story from China. New York: Philomel. Arizpe, E. & McAdam, J. (2011). Crossing visual borders and connecting cultures: children’s responses to the photographic theme in David Wiesner’s Flotsam. New Review of Children’s Literature and Librarianship 17 (2), 227-243. Baker, C. & Jones, S. P. (Eds.). (1998). Encyclopaedia of Bilingualism and Bilingual Education. Clevedon: Multilingual Matters. Barratt-Pugh, C. (1994). ‘We only speak English here don’t we?’: Supporting language development in a multilingual context. In L. Abbott & R. Rodger (Eds. ), Quality Education in the Early Years. Buckingham: Open University Press, pp. 115-131. Barratt-Pugh, C. (2000). Literacies in more than one language. In C. Barratt-Pugh & M. Rohl (Eds. 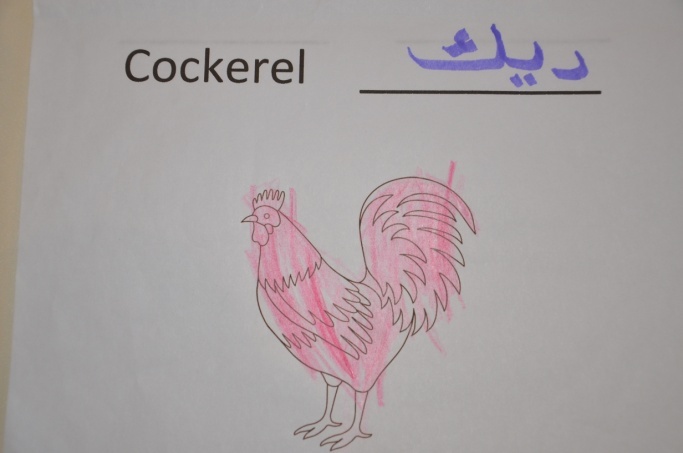 ), Literacy Learning in the Early Years. Australia: Allen & Unwin, pp. 172-196. Bloome, D. & Egan-Robertson, A. (1993). The social construction of intertextuality in classroom reading and writing lessons. Reading Research Quarterly, 28 (4), 304-333. Bloomsbury Qatar Foundation Publishing. (2011). Qatari folk tale shortlisted for Etisalat Prize. Retrieved from http://www.bqfp.com.qa/press-en/bqfp-press-en/qatari-folk-tale-shortlisted-for-etisalat-prize . Botelho, M. J. & Rudman, M. K. (2009). Critical Multicultural Analysis of Children’s Literature. Abingdon: Routledge. Byram, M., Nichols, A. & Stevens, D. (2001). Developing Intercultural Competence in Practice. Clevedon: Multilingual Matters. Esteban-Guitart, M. & Moll, L. C. (2014). Funds of Identity: A new concept based on the Funds of Knowledge approach. Culture & Psychology, 20 (1), 31-48. Gonzalás, N., Moll, L. C. & Amanti, C. (2005). Funds of Knowledge: Theorizing Practices in Households, Communities and Classrooms. Abingdon: Routledge. Gopalakrishnan, A. (2011). Multicultural Children’s Literature: A Critical Issues Approach. London: Sage. Lambert, W. E. (1981). Bilingualism and language acquisition. Annals of the New York Academy of Sciences, 379 (1), 9-22. Lightbown, P. M. & Spada, N. (2006). How Languages are Learned (3rd ed.). Oxford: Oxford University Press. Mathis, J. B. (2011). Multicultural literature: reading and responding within contemporary contexts. In A. W. Bedford & L. K. Albright (Eds. ), A Master Class in Children’s Literature: Trends and Issues in an Evolving Field. Urbana, IL: National Council of Teachers of English, pp. 93-108. Moll, L.C., Amanti, C., Neff, D. & Gonzalez, D. (1992). Funds of Knowledge for teaching: using a qualitative approach to connect homes and classrooms. Theory Into Practice, 31 (2), 132-141. NALDIC. (2013). More about the languages of bilingual pupils. In Languages in Schools. Retrieved from http://www.naldic.org.uk/research-and-information/eal-statistics/lang. Scottish Government. (2014). Summary Statistics for Schools in Scotland, No. 4: 2013 Edition. Retrieved from http://www.scotland.gov.uk/Publications/2013/12/4199/16 . Short, K. G. (2011). Building bridges of understanding through international literature. In A. W. Bedford & L. K. Albright (Eds. ), A Master Class in Children’s Literature: Trends and Issues in an Evolving Field. Urbana, IL: National Council of Teachers of English, pp. 130-148. Sipe, L. (2008). Storytime: Young Children’s Literary Understanding in the Classroom. New York: Teachers College Press. Yokota, J. (1993). Issues in selecting multicultural children’s literature. Language Arts, 70 (3), 156-167.